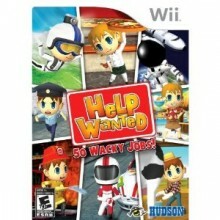 Hudson’s “Help Wanted” is a funny collection of games that’s sure to kill plenty of time. The graphics: This game is like one big hilarious comic strip. Most of the visuals are very simplistic 3D cartoon-like designs and they aren’t very technically impressive, but there’s a lot to love. The game has a lot of charm and the characters are hilarious, straight down to the adorable cows. As for the user interface, it’s very easy to navigate and set up in such a way that just about anyone should be capable of getting wherever they want to be in the game. The sound: There’s a lot of weird stuff going on, but the sound is very basic. You’ll hear comical sounds in some games, generic and serious sounds in other games and downright weird sounds in a few others. The music isn’t all that varied and generally isn’t anything to write home about, but it doesn’t get annoying at all. There’s not much to be said about the sound, but it’s fitting enough to get the job done, for sure. The concept: In a world filled with a ton of unemployed people, it’s difficult to find a job. This game answers that call! You’re placed into a world with 50 jobs that all pay out in virtual currency that has basically no purpose. It’s not a real job, for sure, but it’s a great way to kill some time while you look for a real job! The gameplay This is a very basic minigame-style setup. You basically pick a job, play the minigame associated with said job, fail or succeed, receive your payout if you succeeded and move on to play another job. This particular preview includes 9 of the 50 jobs slated to be included in the final version. The 9 games I had the chance to play include “Body Builder”, “Clown”, “Dairy Farmer”, “Farmer”, “Fisher”, “Grill Cook”, “Haunted House Crew”, “Stunt Person” and “Tailor”. The jobs are fairly self-explanatory and range from simple up-and-down motions to perform juggling actions all the way to simple driving mechanics as a stunt driver. It’s a very basic setup, but it’s tried, tested and flawless. There wasn’t an issue with the controls and from what of the game I’ve experienced, I think this is going to be a solid collection of minigames when the full version hits the market. It should be relatively inexpensive and is likely to eat a whole lot of your time for a good while. You can expect “Help Wanted” by Hudson to be released sometime this summer.